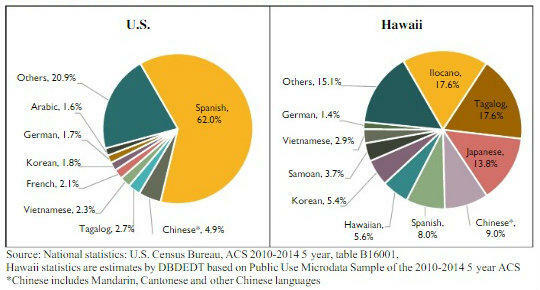 A graph charts languages other than English spoken at home in Hawaii, in comparison to the greater U.S. The report shows the number of non-native speakers vary significantly by county. The highest proportion is in Honolulu, where 28% speak a language other than English. The report also reveals economic setbacks for residents with low English proficiency. They often earn less money and are more concentrated in food service and cleaning or maintenance jobs. One out of four Hawai’i residents claims a multi-ethnic heritage, the highest proportion in the nation, according to the U.S. Census Bureau. In his first installment in HPR’s “Neighbors: An Island Story” series, HPR’s Wayne Yoshioka visited with one local family for a baby luau, a celebration of diversity and the melting pot Hawai’i has become.